You'll Spend thousands on a "Couples Retreat"
So learn what to look for, ahead of time, to choose wisely. Couples Therapy Retreats are Popular. But they aren't all alike. 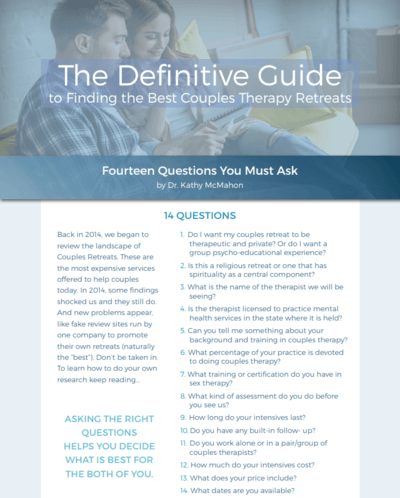 We did a survey in January of 2016 and found that even retreats touted as "The Best" were conducted by people without any couples therapy credentials whatsoever. We found the same thing in 2018. This free guide contains 14 questions to ask. Which of the Therapist's credentials matter and why. "Packaged" Retreats & Why you might prefer to choose your own options. Verifying credentials in intimacy and sexuality.